That’s it – plate up! I usually serve mine with a little brown rice, drizzling the cooked marinade over the top for a bit of a zesty kick. It’s such an easy, healthy mid-week meal and (including marinating time), you can have this meal on the table in 30 minutes – so imagine how quickly Jamie Oliver could do it! Alright, that’s it from me – tonight I must finish off a little work so I can renew my registration with Fitness Australia. Have a great night! 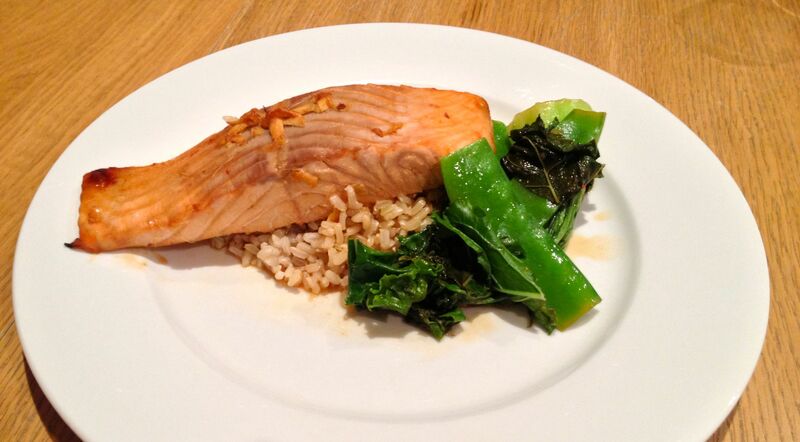 Is this the same salmon dish you used to cook when we lived in Canberra? Yeah you used to pan fry it. You were slightly obsessed with it. I am pretty sure you just discovered the receipe. Hahaha – at least some things never change! Thanks great recipe whole family wanted more!